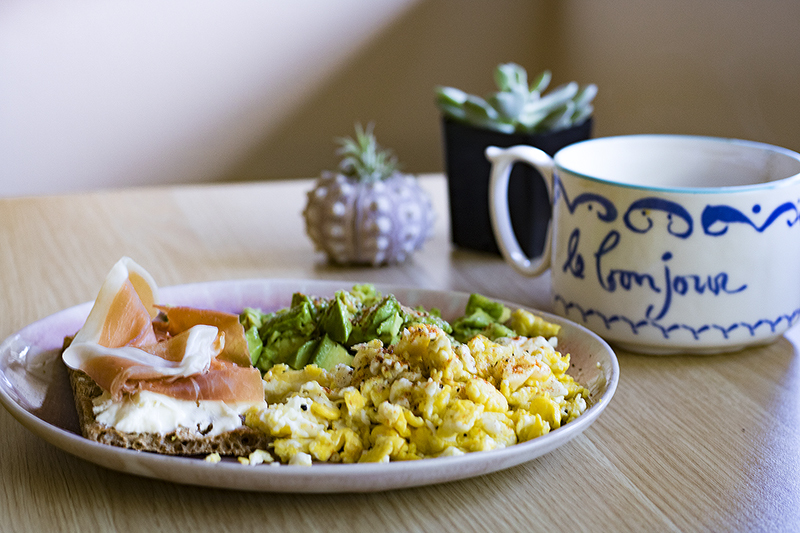 Saturday brunch: Wasa bread + brie + prosciutto, scrambled eggs, avocado, coffee. Hello, June! It's a new month and you know what that means? I've submitted the final draft of my thesis so, pending final approval by the dean of my graduate institution (as well as arrival of my diploma), my Ph.D. is official. You may call me Dr., but nobody does that. Honestly, having those three letters after my name doesn't feel drastically different. I never have to take another academic exam in my life so that's a new and strange feeling. People keep telling me that I'm now living the postdoc life so it should be less stress! They say it takes 21 days to establish a new habit so I want to dedicate June towards being more frugal with my money. Now that I am officially out of school, my student loans are kicking in. Living alone means paying more in rent and footing 100% of all utilities. Living is expensive! Your girl has a bad habit of eating out a lot so I'm making it my goal to cook almost all my meals at home this month. I also need to eat more red meat so I'm cycling through making red sauce with meatballs or ground beef to eat over orecchiette or barley. The Saturday brunch was what I had for breakfast both weekend days. It was pretty yummy because I don't believe that eating at home should be boring. I've finally purchased a coffee maker as well so I can stop bleeding money each morning. 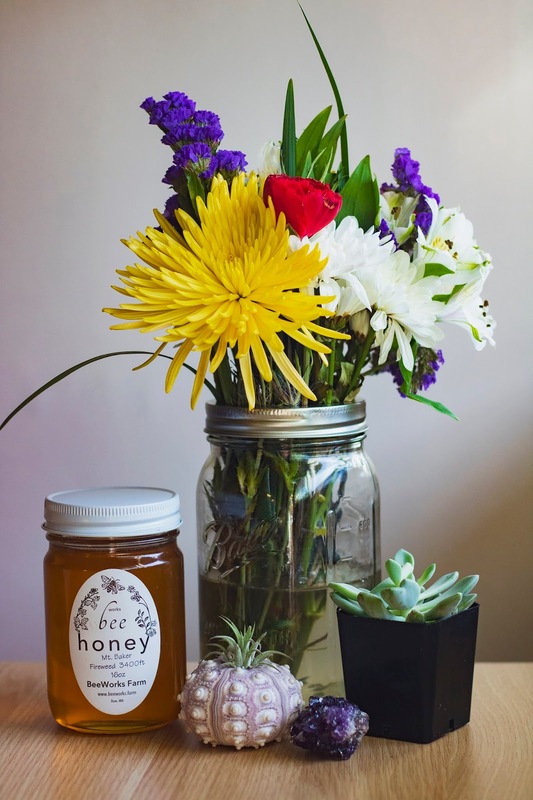 The honey up there was a cheeky purchase from the farmer's market so maybe I can switch to black tea some mornings. We had a four day work week though everyone in our lab went in to work on Memorial Day for some capacity. I had a fairly eventful work week for four days. For one, I'm troubleshooting things in lab which isn't fun, but necessary. 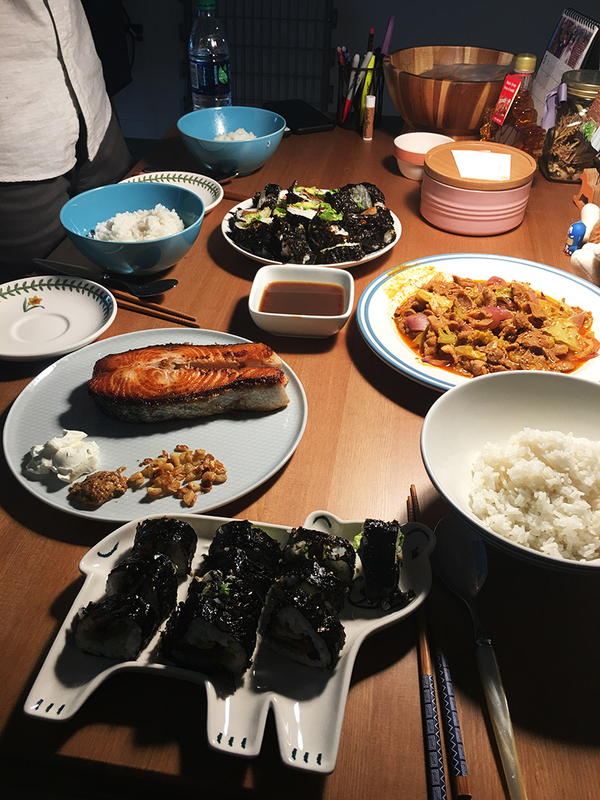 I was invited to enjoy a wonderful homemade meal (gimbap, salmon, pork with veggies, and rice!) with good company. I am planning a menu to invite them over in turn. Having company also entails that I get some seating arrangement for my apartment which is pretty much completely set up now! I only have one chair that I use with my desk so I need some dining chairs or floor cushions. 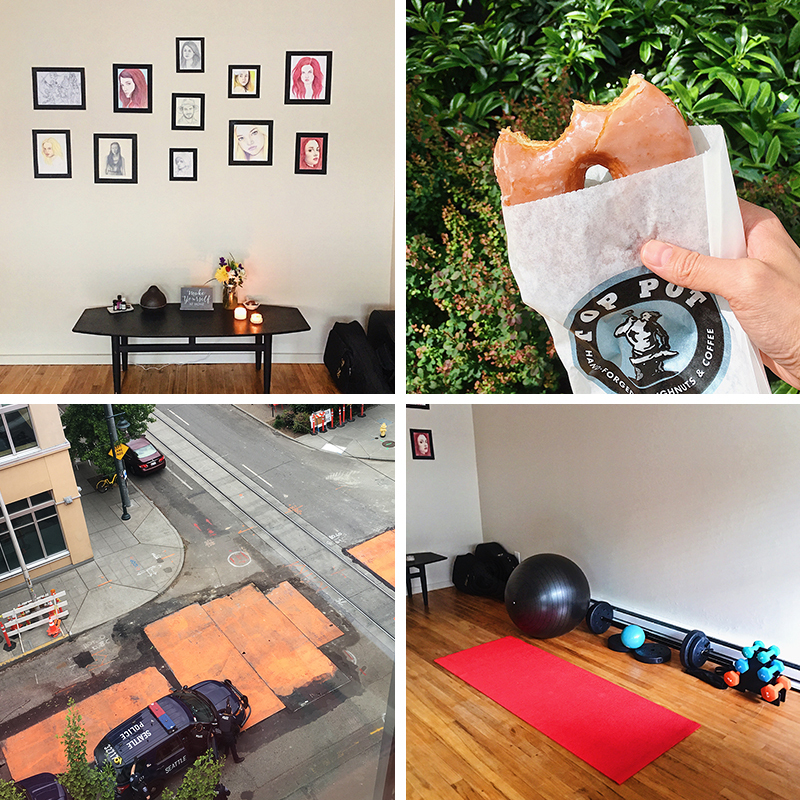 I'm sharing a photo of my living room which functions as an office and home gym. I don't have a couch or TV, but that's not really necessary! I can consume trash TV in my bedroom, sitting on my memory foam mattress, and with my laptop perched on top of a coffee table I acquired from my boss. Friday was National Donut Day and our lab had planned to get some donuts. However, the morning donut trip was postponed by a police standoff in the middle of the city! Probably against our better judgement, everyone in the building clustered around the office windows to watch. There were policemen with guns and rifles aimed at an armed man in the middle of the street. Thankfully, no one was hurt and the suspect was taken into custody. We ended up getting our donuts after the streets were cleared for occupancy again. I've never seen a rifle in real life and it was definitely one of the craziest things I've observed here because Seattle's been very calm so far. I've spent most of my weekend catching up on sleep, cleaning my house, and doing massive amounts of laundry (clothing, towels, and sheets). That probably sounds boring to a lot of you, but I'm a homebody and getting to be a hermit for two days taking Me Time is really my dream. Now I'm upon the bittersweet hours of Sunday night when the weekend is almost over, writing this post whilst listening to 80s music. 1. What recipes do you turn to for meal prep? 2. What is your ideal weekend like? 3. What is your favorite donut? Gorgeous flowers! That police standoff sounds quite scary. Glad it was all okay in the end. 3. Fresh cinnamon donut! But if they aren't piping hot, then custard filled. 2) either relaxing with Netflix all weekend or a fun girls day. Depends on how I feel. 3) it’s between a classic glazed or chocolate! Congratulations on the PhD, Dr!! I am also trying to be more frugal. My bills make me want to cry. 3) I like a classic cinnamon sugar one! Congratulations on your PhD!!! What an accomplishment! 2.) Ideal weekend is grocery shopping then making a home cooked meal at home with my husband. And going for a walk and stopping by the ice-cream store. 3.) I don't eat donuts anymore.